The blizzard of bloatware we found on PCs at Best Buy is just a snapshot in time of the products we examined in the store. However, it should give you an idea of how much bloatware you're likely find on retail machines. We sampled several machines at a local Best Buy, where we could examine the included software in person. (Any links to Best Buy were active and working at press time.) 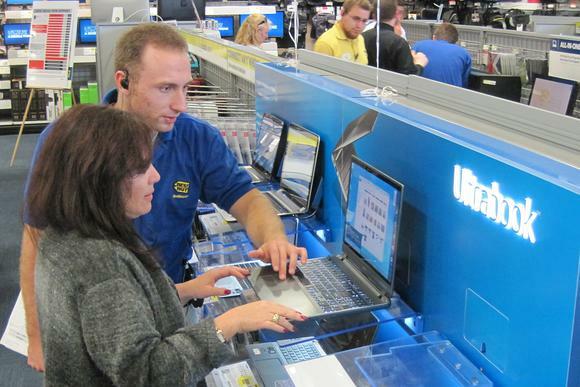 Note that some of the laptops sold at a retailer like Best Buy are exclusive to the store—sometimes called out using a “BB” designation—even though they many be almost but not quite identical to models sold by other stores like Amazon. This tactic enables the retailer to avoid price matching, since other stores won’t offer an identical product. Where we could, we listed every app that Windows included in the Windows 8 Start page. In certain cases, apps may be bundled together in a suite of utilities; we still noted them as separate apps, as Windows did. Also take note of the Retail Processor App from Intel and the Productivity with Windows app from Microsoft: From what we could see, these apps are loaded onto floor models and used to extol the virtues of Windows and Intel’s own processors. They probably won't be loaded onto the products that you buy. We excluded Microsoft’s native Windows apps, such as Paint. In some cases, Microsoft also bundles trial versions of Microsoft Office or Office 365; you’ll have to decide whether those are bloatware or not. Best Buy also includes the option to download a free game from AMD’s Web site as well as a year’s subscription for Webroot Secure Anywhere. Best Buy also includes a downloadable one-year subscription to Trend Micro’s Titanium Internet Security.